Cambridge Audio Air 200 review | What Hi-Fi? We see nothing wrong with being a minx. Nonetheless, Cambridge Audio has shaved it from the moniker for the second generation of the previously named Minx Air wireless speakers. The numeral in the new Air 200’s name represents a claimed 200W delivered by its Class D digital amplifier. That clout is emitted via a pair of Cambridge Audio’s 57mm BMR drivers, the same as found in their £1000 Aeromax 6 floorstanding speakers, a 16.5cm woofer (with a bass port disguised cunningly as a handle). It is fairly weighty – 5.1kg to be precise – which makes it feel like you’re handling something worthy of the price. 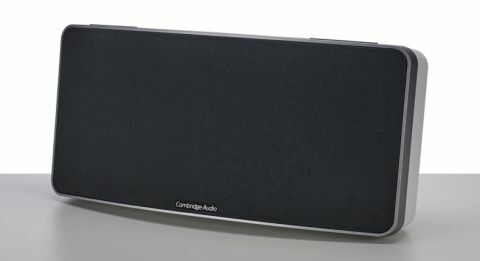 We like the design too: understated and uncomplicated, in keeping with Cambridge Audio’s hallmark aesthetic. All you see from its fascia is a modest company logo and an LED indicator shining from behind the grille. On its rump are left and right auxiliary inputs, a 3.5mm jack, ethernet port and a dial for bass adjustment. On its head, ten buttons: five for internet radio presets, two for source changing, another pair for volume tweaking and the all-important on/off button. There is a remote control included, which performs the same functions as on the unit itself, and also accesses five extra presets. We find the Air 200 is best and most easily controlled using the free app. It is also through this colourful, fresh-looking app you are able to access internet radio and change EQ settings more freely. Connecting via AirPlay, Bluetooth or Spotify Connect is straightforward. Network connection without an Apple device is a more cumbersome web-based operation, but nonetheless needs doing only once. Once set up, we play Vennart’s The Demon Joke. The opening track Two Five Five perfectly shows off the Air 200’s power: the soundscape created by those first expansive chords is painted with bold strokes and a wealth of bass weight. Despite that low end, there is still a decent balance without needing to tamper with the EQ. Besides, the bass adjustment tool tends to be rather heavy-handed. There is a good sense of timing as well: the harsh stomp of Doubt, for example, is played as a regimental march that isn’t slowed by the anchoring low end but channels energy from the punch the Air 200 packs. Changes in rhythm are well tracked, giving proper effect to Mike Vennart’s often purposefully awkward time signatures. When the album arrives at the more delicate Don’t Forget The Joker, the Air 200 is ably tactful. There is still great body to instruments and Vennart’s voice, but the speaker is aware enough dynamically to carry the song rather than drive it. It would also help if the Air 200 were better organised in terms of layering the parts. There is a good amount of detail, but it isn’t always clearly separated. When we compare it with the B&W Zeppelin Wireless, the differences are noticeable: the Zeppelin is more spacious, with better detail, dynamics and organisation. But it is also £100 dearer and isn’t capable of the same room-filling power as the Air 200. Likewise, pitting it against the five-star Sonos Play:5, this time only £30 more expensive, highlights both strengths and weaknesses. The Sonos is considerably more closed in, but is capable of more expression and subtler dynamics. The Air 200 is bold, powerful and driven. We’d like a little more from its dynamic range, but if you’re after heavyweight punch at a reasonable price, you could do much worse.